Relax, no one is going to take away your gasoline-powered dirt bike. 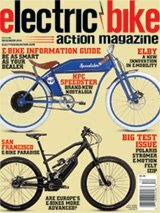 KTM just released the Freeride E-XC electric bike in America, but it’s not part of a bigger agenda to make us all plug in. The new bike is part of a market test to see if there’s enough interest in the U.S. to invest more time and resources in the project. Once again, it’s not about us. In Europe, there are a bunch of incentives to go electric, and we have a U.S. version as a byproduct. When you get past the knee-jerk response, the Freeride-E is a pretty interesting concept. First, you have to understand that the Freeride isn’t a motocross bike, it isn’t a racer and it isn’t a dual-sport bike, either—at least not in America. In Europe it’s street-legal, but KTM hasn’t yet gone through the U.S. homologation process. It’s a pure trail bike. It shares the same chassis with the two-stroke Freeride that was introduced two years ago, and has many of the components from the 85SX. KTM developed the motor internally, and unlike other electric motorcycles, it has a gear-driven reduction shaft, it’s liquid-cooled and carries a small oil supply. Most of the technology is in the lithium0ion battery, which can be removed and replaced easily if you want to rotate through spares. Average ride time is about an hour, and average charge time is about the same. The battery requires a separate charger and a 220-volt outlet. We got to ride the E for a day and had a blast once we stopped being threatened by it. The sensation of riding without engine noise is a little weird; it’s like riding a mountain bike at superspeed. The E-XC is really powerful, but not in the same way a gasoline-powered bike is. When you twist the throttle fully open, all the torque is delivered at once. If you twist the throttle halfway, half of max torque is produced. There’s no waiting for engine rpm to ramp up, which is an irrelevant concept. There’s no clutch and no gear shifter. So, if you just whack open the throttle from a standstill, as you can on a gasoline bike, there’s too much output at once and the bike spins wildly. Riding an e-bike requires much more careful throttle control. Once the bike is moving, the roll-on power isn’t that dramatic and traction is much easier to control. In terms of acceleration, the E-XC could easily hang with 250 two-strokes (provided there’s traction) from 0 to 20 mph. From 20 mph on up, the E-XC isn’t nearly as strong. There are three power settings, although only two are really usable. The lowest is just for limping home if you’re almost out of juice. The chassis isn’t designed for hard riding. It’s faintly reminiscent of a trials bike but with a normal seat height. The pegs are high, and the machine has great ground clearance. The E-XC is meant to be ridden standing up. It feels a little awkward in turns when you’re seated, but it’s capable of a blistering trail pace once you figure out its weird quirks. One of the weirdest is the fact that the rear brake is on the left handlebar, where the clutch normally is.